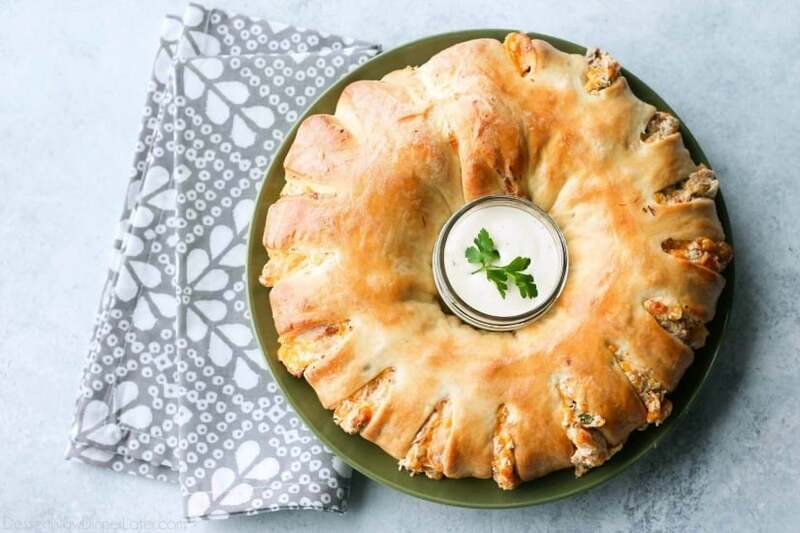 Bacon Chicken Ranch Sandwich Ring - Dessert Now, Dinner Later! 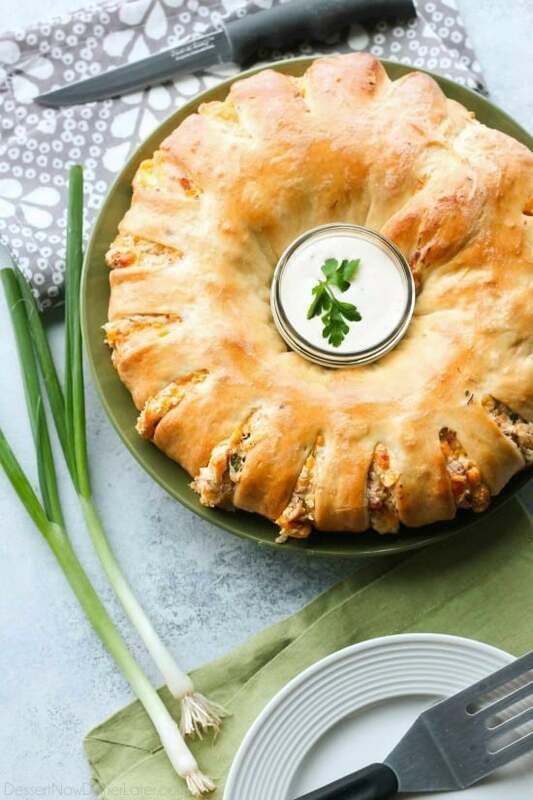 This Bacon Chicken Ranch Sandwich Ring makes a great dinner or party appetizer! 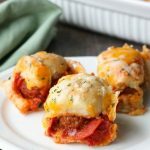 It’s meaty, cheesy, and full of flavor! Dinner can be a tricky thing with 3 young children. 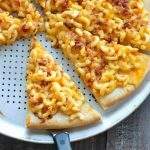 I usually try to have at least one element on the dinner plate that each child will like, but every once in a while I actually make something that EVERYONE loves. Which is a rarity, but this Bacon Chicken Ranch Sandwich Ring can now go on that list! 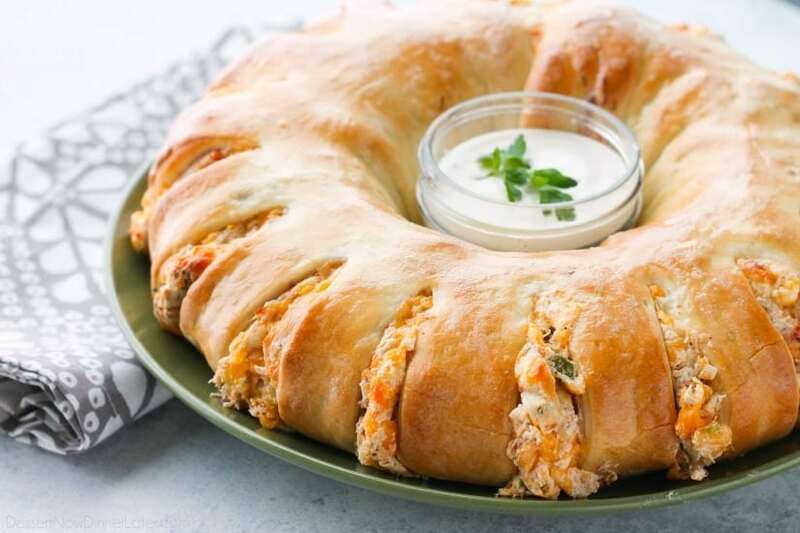 This sandwich ring is almost like eating pizza, but in a fun rolled up loaf of bread that is loaded with cheeses, meats, and everyone’s favorite ranch seasoning. I mean, who doesn’t love ranch?! I wish you could have smelled my house when I made this. Everyone’s stomach’s were growling! I had to snap pictures fast because I had a crew of hungry eaters ready to pounce! We were not disappointed! 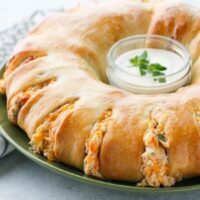 This Bacon Chicken Ranch Sandwich Ring is so yummy! 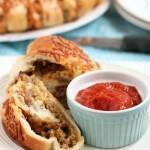 Hot sandwiches like this make for great party food too! It’s even meaty and manly enough for game day grub. 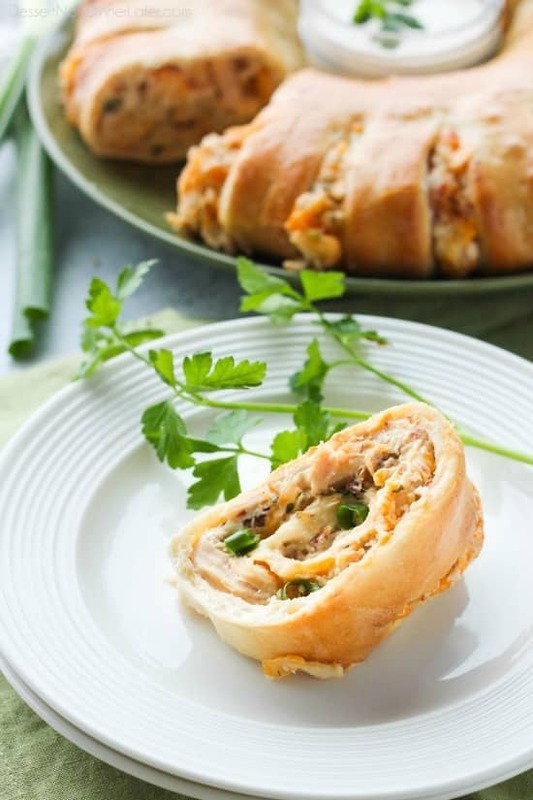 No matter what you make it for, I know you will love this Bacon Chicken Ranch Sandwich Ring. Enjoy my friends! 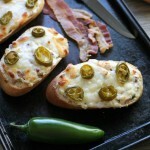 Place 1 loaf of Rhodes White Bread on a baking sheet/pizza pan that has been lightly greased with cooking spray. Cover with sprayed plastic wrap until thawed and slightly risen; about 5 hours. TIP: If you keep the bread covered with sprayed plastic wrap overnight in the refrigerator, it's ready to go the next day. Mix the chicken, bacon, softened cream cheese, HALF (1 cup) of the shredded cheese, dry ranch mix, and green onions together in a large bowl until combined. On a counter sprayed with non-stick cooking spray or a silicone baking mat, roll the Rhodes loaf into a large 18x16-inch rectangle. 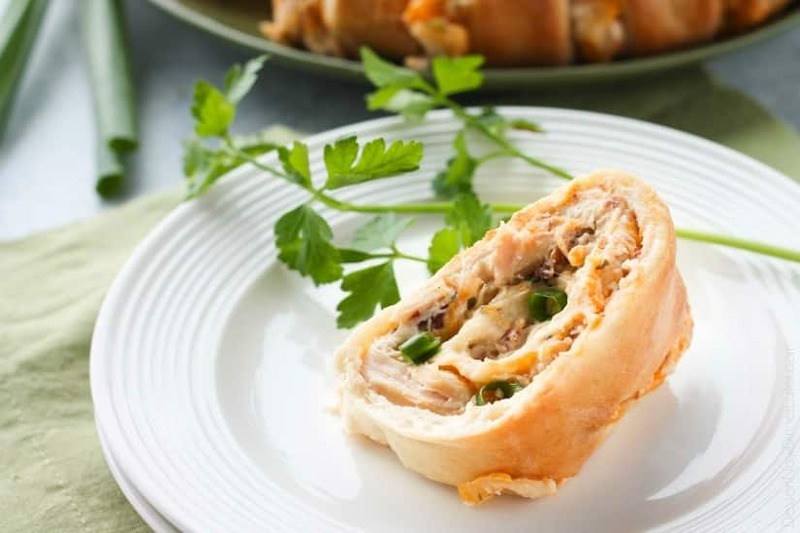 Spread the chicken mixture onto dough evenly to within 1/2-inch of the edge. Sprinkle with the remaining cup of cheese. Roll dough up starting on a long side. Pinch to seal seam. Place seam side down on a sprayed baking sheet/pizza pan to form a circle. Pinch ends together. *Optional: Place an oven safe bowl/ramekin in the center of the ring to help retain the circle in the middle. Make cuts with scissors all the way around the outside of the ring. The cuts should be about 1-inch apart and two-thirds of the way into the ring. Cover with sprayed plastic wrap and let rise 30-45 minutes. Remove wrap and bake at 375 degrees Fahrenheit for 20 minutes. Cover with foil and bake 20 minutes more. Serve with ranch dressing for dipping, if desired. Refrigerate leftovers in an airtight container.